Is Google Ready to Release a New Mobile Algorithm? 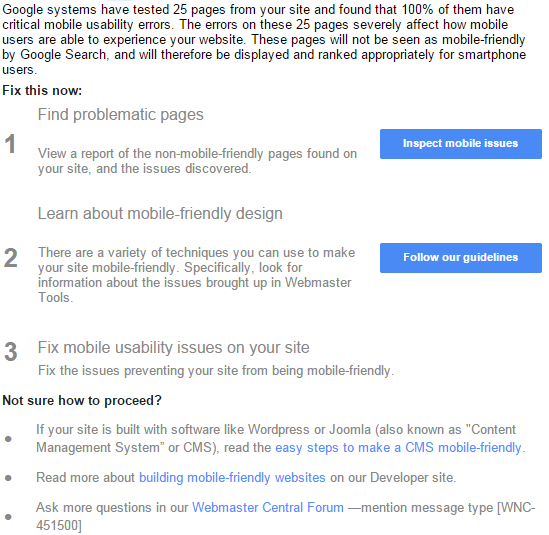 Google has begun sending mobile usability notifications via Google Webmasters Tools to sites that are not currently mobile- friendly. The message goes on to say Google has tested a number of pages on your website and found 100% of the pages having mobile usability errors. Pages found with errors will not be seen by Google Search meaning these pages will not rank well in mobile search. Google has given options to fix mobile usability errors by viewing a report for the non-mobile-friendly pages found on your website. You can also learn more about a mobile-friendly design for your website through Google Webmasters Tools. To test to see if your website is mobile friendly take the Mobile-Friendly Test.